New York: The current exhibit ‘Journey to the Roots’ at the National Gallery of Modern Art (NGMA), Delhi, evokes a sense of nostalgia. As the title notes, the exhibit celebrates the 125th centennial of Jamini Roy (1887-1972), one of India’s most celebrated 20th century artists. He is one of the pioneers of modern Indian art, who revolutionized the field and created a new visual language. A language that was more egalitarian and forthright. I would like to quote the Cultural Minister Chandresh Kumari Katoch who described the artist in the best light: “Jamini Roy’s contribution in the growth and shaping of modern Indian art is well-established and enormously significant. His artworks have a particular appeal in the popular imagination because of their strong, simple forms and vibrant colours…” His painting style is an eclectic representation of both Western training and Indian inspiration. Seeing his style one might refer to him as modern India’s outsider artist. But there is lot more to the artist and his work. Born in Beliatore, West Bengal, his repertoire evolved from classical British academic nudes and landscapes to scenes that appropriated forms of folk and calligraphic expression. A student of Abanindranath Tagore at Santiniketan, Calcutta, he was trained in western academic styles. He later gained inspiration from Indian epics and episodes such as the Ramayana and Mahabharatha for his two dimensional paintings. 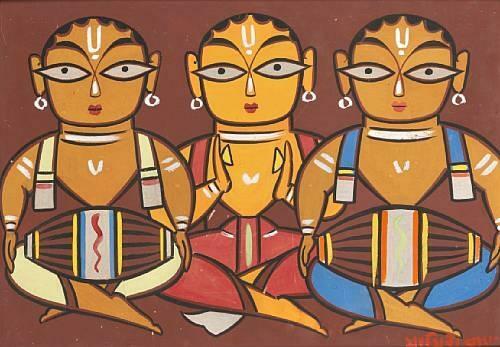 His oeuvre was also strongly influenced by Kalighat Patuas, a popular painting genre from his region. This folk painting style is linear, with bold and vibrant colors. Jamini Roy had captured the essence of this traditional Bengali style of painting and incorporated it with his own modern sensibility. 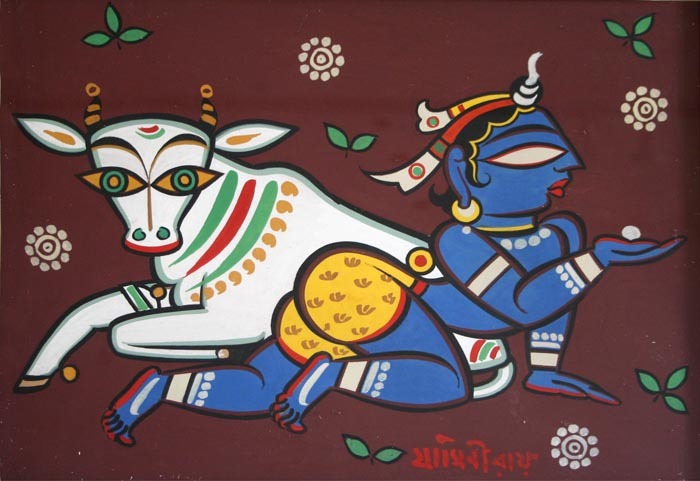 The NGMA exhibit is an odyssey through the artistic explorations of Jamini Roy’s lifetime. A mellifluous blend of modern thought with traditional themes and indigenous brush strokes, his works speak volumes. To read more on the exhibit click here.